Difference between revisions of "Spectrograms"
What we would like is for each octave to be given the same height in the graph. 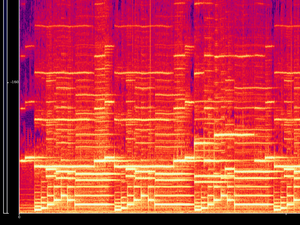 The spectrograms used in the WikiDelia are not the usual kind. Their vertical scale is logarithmic, which gives the same number of pixel rows per semitone. 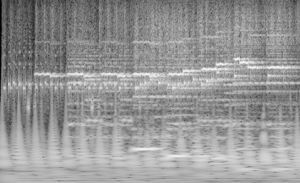 The spectrograms used in the WikiDelia are not the usual kind. Their vertical scale is logarithmic, which gives the same number of pixel rows per octave. 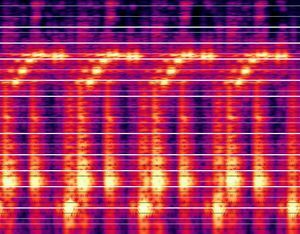 * On the piece's page in a section '''Spectrogram''' usually just above '''Availability''' so that the Listen button is near. If this interests you, please [[Donate|Make a small donation]] and email <TT>delia.derbyshire.net&#64;gmail.com</TT> attaching the sound file you would like turned into a picture. Alternatively, if you can compile C for Linux, you can fetch [https://github.com/martinwguy/spettro spettro from github], which plays music files while showing a log spectrogram of it scrolling right to left with the current playing time at centre screen. 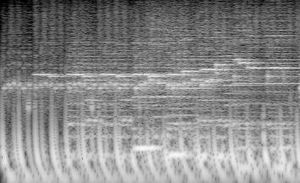 Spectrograms are used in the WikiDelia to visualise the sonic content of Delia's music. 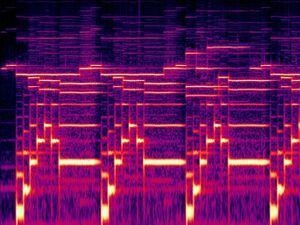 4 Get spectrograms of your music! Most FFT-based spectrographic programs' output has a linear frequency axis, usually from 0Hz to 22050Hz for a CD-quality piece, in which the top half of the graph represents the top octave of the sound, the inaudible 11025-22050Hz band, with all the musical detail crushed into the bottom rows of pixels. Even if you zoom in on the interesting part of the spectrogram, the top half of the graph always represents the top octave of the visible frequency range. 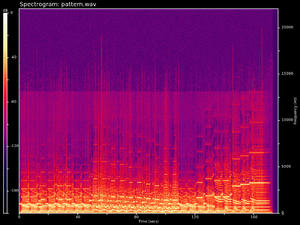 On the piece's page in a section Spectrogram usually just above Availability so that the Listen button is near. 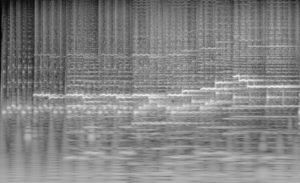 The WikiDelia's spectrum analyser, "mkjpg", was written specifically for it using a modified version of sndfile-spectrogram to prepare a linear spectrogram which is then distorted by an ImageMagick script to give it a logarithmic frequency axis. The program "Sox" can also be used to produce the linear spectrogram, but you need this modified version to remove the limits on output image size, to normalise the output's brightness, and to make it 250 times faster and not need 16GB of RAM. Judith Brown's brute force algorithm, "logft" from 1988-91. An optimized version of the above, "constant-q-cpp", doing octave decimation of the signal to save compute time. The results with the implementations I have found have so far been disappointing: crisper at the top but lacking temporal detail in the lower frequency range. the next release of sndfile-tools (after 1.03) will include a new --log-freq option to sndfile-spectrogram achieving the same effect as here. In the meantime, if you can compile C, you can get it on github. Get spectrograms of your music! Optionally the software can superimpose single-pixel black and white lines at the frequencies of the piano keys and three-pixel-wide white lines at the positions of the manuscript stave lines, see the example on the right. If this interests you, please Make a small donation and email delia.derbyshire.net@gmail.com attaching the sound file you would like turned into a picture. Alternatively, if you can compile C for Linux, you can fetch spettro from github, which plays music files while showing a log spectrogram of it scrolling right to left with the current playing time at centre screen. Random Together 1, 2m30 of cacophony, not helped at all by the reconstruction! ↑ An efficient algorithm for the calculation of a constant Q transform by Brown and Puckette. ↑ An earlier implementation in more C-like C++ in a pitch detection plugin for Supercollider, licensed under GPL. ↑ Constant-Q Transform Toolbox for Music Processing: An optimization in MATLAB of Brown and Puckette's efficient Constant-Q algorithm. ↑ C++ Constant-Q at soundsoftware.co.uk, a C++ implementation of the above with permissive license. This page was last modified on 10 February 2019, at 13:00.